^ a b c d e f g h i j k l m n o p q r s t Murphy, Kenneth (2012). Janeway's Immunobiology 8th Edition. New York, NY: Garland Science. ^ a b Cooper, Max D. (2015-01-01). "The early history of B cells". Nature Reviews Immunology 15 (3): 191–7. ^ a b Kondo, Motonari (2010-11-01). "Lymphoid and myeloid lineage commitment in multipotent hematopoietic progenitors". Immunological Reviews 238 (1): 37–46. ^ a b Pelanda, Roberta; Torres, Raul M. (2012-04-01). 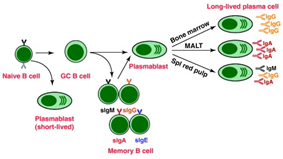 "Central B-Cell Tolerance: Where Selection Begins". Cold Spring Harbor Perspectives in Biology 4 (4): a007146. ^ a b Martensson, Inga-Lill; Almqvist, Nina; Grimsholm, Ola; Bernardi, Angelina (2010). "The pre-B cell receptor checkpoint". FEBS Letters 584 (12): 2572–9. ^ a b c LeBien, Tucker W.; Tedder, Thomas F. (2008-09-01). "B lymphocytes: how they develop and function". Blood 112 (5): 1570–1580. ^ Loder, By Florienne; Mutschler, Bettina; Ray, Robert J.; Paige, Christopher J.; Sideras, Paschalis; Torres, Raul; Lamers, Marinus C.; Carsetti, Rita (1999-07-01). "B Cell Development in the Spleen Takes Place in Discrete Steps and Is Determined by the Quality of B Cell Receptor–Derived Signals". The Journal of Experimental Medicine 190 (1): 75–90. ^ a b c d Chung, James B.; Silverman, Michael; Monroe, John G. (2003-01-06). "Transitional B cells: step by step towards immune competence". Trends in Immunology 24 (6): 342–348. ^ Cerutti, Andrea; Cols, Montserrat; Puga, Irene (2013-01-01). "Marginal zone B cells: virtues of innate-like antibody-producing lymphocytes". Nature Reviews Immunology 13 (2): 118–32. ^ Harwood, Naomi E.; Batista, Facundo D. (2010-01-01). "Early Events in B Cell Activation". Annual Review of Immunology 28 (1): 185–210. ^ a b Yuseff, Maria-Isabel; Pierobon, Paolo; Reversat, Anne; Lennon-Duménil, Ana-Maria (2013-01-01). "How B cells capture, process and present antigens: a crucial role for cell polarity". Nature Reviews Immunology 13 (7): 475. ^ a b c d e f g h i j Nutt, Stephen L.; Hodgkin, Philip D.; Tarlinton, David M.; Corcoran, Lynn M. (2015-01-01). "The generation of antibody-secreting plasma cells". Nature Reviews Immunology 15 (3): 160. ^ Asokan, Rengasamy; Banda, Nirmal K.; Szakonyi, Gerda; Chen, Xiaojiang S.; Holers, V. Michael (2013-01-01). "Human complement receptor 2 (CR2/CD21) as a receptor for DNA: Implications for its roles in the immune response and the pathogenesis of systemic lupus erythematosus (SLE)". Molecular Immunology 53 (1–2): 99–110. ^ Zabel, Mark D.; Weis, John H. (2001-03-01). "Cell-specific regulation of the CD21 gene". International Immunopharmacology. Unraveling Mechanisms and Discovering Novel Roles for Complement 1 (3): 483–493. ^ Blum, Janice S.; Wearsch, Pamela A.; Cresswell, Peter (2013-01-01). "Pathways of Antigen Processing". Annual Review of Immunology 31 (1): 443–473. ^ a b c d Crotty, Shane (2015-01-01). "A brief history of T cell help to B cells". Nature Reviews Immunology 15 (3): 185–9. ^ MacLennan, Ian C. M.; Toellner, Kai-Michael; Cunningham, Adam F.; Serre, Karine; Sze, Daniel M.-Y. ; Zúñiga, Elina; Cook, Matthew C.; Vinuesa, Carola G. (2003-08-01). "Extrafollicular antibody responses". Immunological Reviews 194: 8–18. ^ a b Shlomchik, Mark J.; Weisel, Florian (2012-05-01). "Germinal center selection and the development of memory B and plasma cells". Immunological Reviews 247 (1): 52–63. ^ a b Bortnick, Alexandra; Chernova, Irene; Quinn, William J.; Mugnier, Monica; Cancro, Michael P.; Allman, David (2012-06-01). "Long-Lived Bone Marrow Plasma Cells Are Induced Early in Response to T Cell-Independent or T Cell-Dependent Antigens". The Journal of Immunology 188 (11): 5389–5396. ^ a b c d e McHeyzer-Williams, Michael; Okitsu, Shinji; Wang, Nathaniel; McHeyzer-Williams, Louise (2011-01-01). "Molecular programming of B cell memory". Nature Reviews Immunology 12 (1): 24–34. ^ a b c d Kurosaki, Tomohiro; Kometani, Kohei; Ise, Wataru (2015-01-01). "Memory B cells". Nature Reviews Immunology 15 (3): 149. ^ Pillai, Shiv; Cariappa, Annaiah; Moran, Stewart T. (2005-01-01). "Marginal Zone B Cells". Annual Review of Immunology 23 (1): 161–196. ^ a b c d Baumgarth, Nicole (2010-01-01). "The double life of a B-1 cell: self-reactivity selects for protective effector functions". Nature Reviews Immunology 11 (1): 34–46. ^ a b c d e Rosser, Elizabeth C.; Mauri, Claudia (2015). "Regulatory B Cells: Origin, Phenotype, and Function". Immunity 42 (4): 607–612. ^ a b Yanaba, Koichi; Bouaziz, Jean-David; Matsushita, Takashi; Magro, Cynthia M.; St.Clair, E. William; Tedder, Thomas F. (2008-06-01). "B-lymphocyte contributions to human autoimmune disease". Immunological Reviews 223 (1): 284–299. ^ III, Arthur L. Shaffer; Young, Ryan M.; Staudt, Louis M. (2012-01-01). "Pathogenesis of Human B Cell Lymphomas". Annual Review of Immunology 30 (1): 565–610. They are responsible for generating the majority of high-affinity antibodies during an infection. Antigens that activate B cells with T cell help are known as T cell-dependent (TD) antigens and include foreign proteins. They are named as such because they are unable to induce a humoral response in organisms that lack T cells. B cell response to these antigens takes multiple days, though antibodies generated have a higher affinity and are more functionally versatile than those generated from T cell-independent activation. B cell activation occurs in the secondary lymphoid organs (SLOs), such as the spleen and lymph nodes. After B cells mature in the spleen, they migrate through the blood to SLOs, which receive a constant supply of antigen through circulating lymph. At the SLO, B cell activation begins when the B cell binds to an antigen via its BCR. The antigen can either be free-floating or presented by APCs such as macrophages or dendritic cells (DCs), and include proteins, glycoproteins, polysaccharides, whole virus particles, and whole bacterial cells. Of the three B cell subsets, FO B cells preferentially undergo T cell-dependent activation while MZ B cells and B1 B cells preferentially undergo T cell-independent activation. While immature and during the T1 phase, B cells express a BCR of class IgM, but BCR expression changes to the classes IgM and IgD after transition into the T2 phase and while mature up to activation. To complete development into mature b cells, immature B cells migrate from the bone marrow to the spleen as well as pass through two transitional stages: T1 and T2. Throughout their migration to the spleen and after spleen entry, they are considered T1 B cells. Within the spleen, T1 B cells transition to T2 B cells. T2 B cells differentiate into either follicular (FO) B cells or marginal zone (MZ) B cells depending on signals received through the BCR and other receptors. Once differentiated, they are now considered mature B cells, or naive B cells. B cells, unlike the other 2 classes of lymphocytes, T cells and natural killer cells, express B cell receptors (BCRs) on their cell membrane. BCRs allow the B cell to bind a specific antigen, against which it will initiate an antibody response.